I love grilling out, and we do it often at our house. We pretty much grill out all year round and have even grilled when we had to shovel a path in the snow to get to the BBQ. That’s dedication! 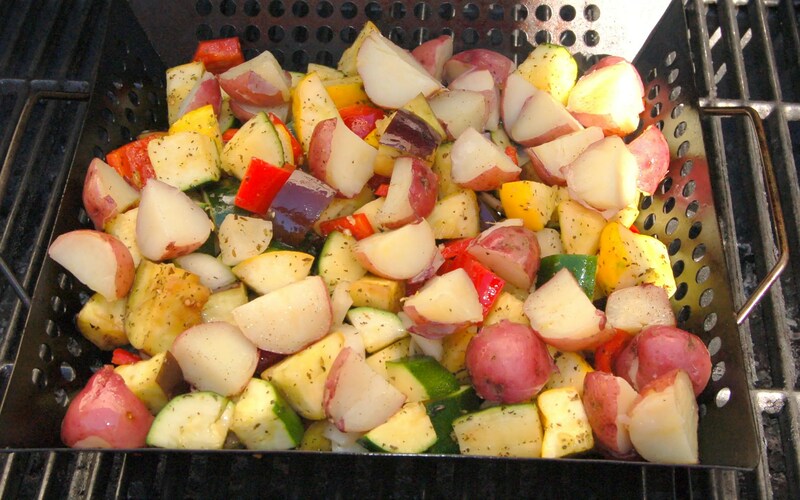 Grilled vegetables are my favorite way to get a boat load of veggies all in one dish. I start by chopping up all the veggies into bite sized pieces. Not too big and not too small. . You have to parboil (or microwave) the potatoes first as I find they take too long on the grill if cooked from raw. 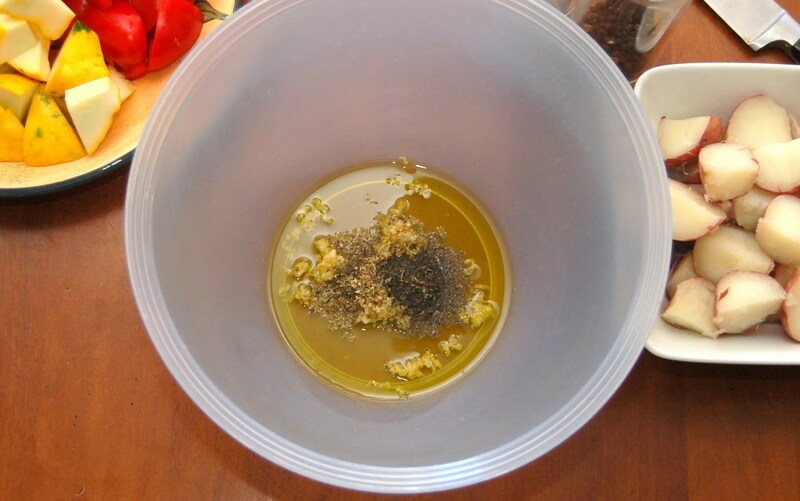 Then I make an oil and herb marinade to toss with the vegetables. Then it’s on to the grill. I recommend getting a grilling basket. It’s a good time of year to buy one now as they are often on sale. I have had mine for years and it’s worth its weight in gold! I have even used it to cook fish that I am worried will fall through the regular grill. 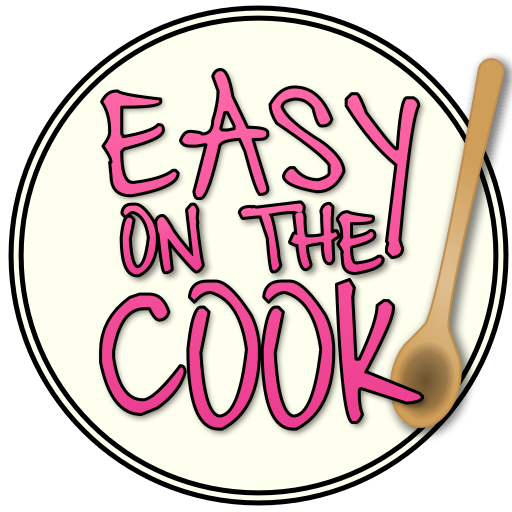 Don’t buy a non-stick one, as I find the grill temperatures ruin the finish quickly. I always preheat mine and spray or brush with cooking oil to make sure nothing sticks. Quick and delicious salad with grilled veggies, arugula and goat cheese. Parboil potatoes in salted water for about 10 to 15 minutes. Potatoes should still be quite firm. Alternatively, microwave potatoes until partially cooked but still firm. 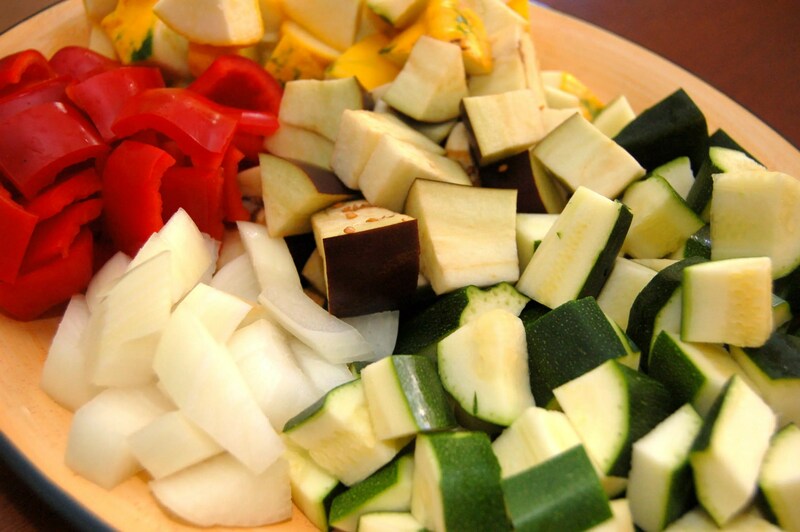 Cut zucchini, squash, onion and eggplant into large chunks approximately 1-2 inches in diameter. At the bottom of a large bowl with a lid mix olive oil, minced garlic, basil and oregano. 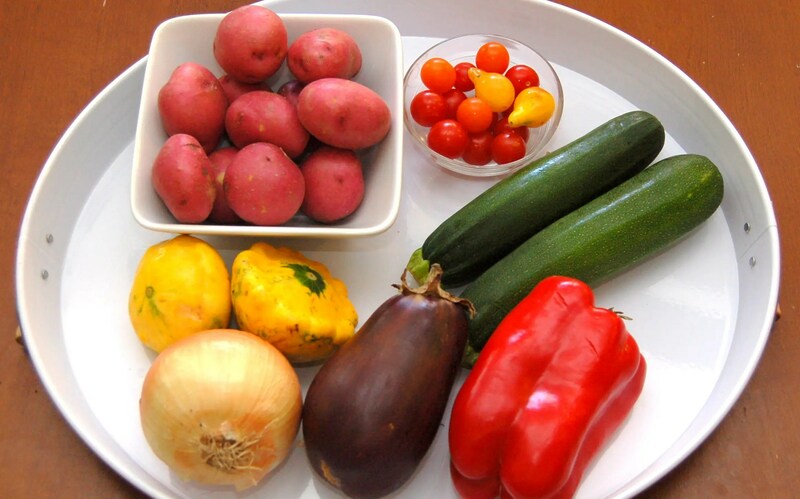 Put all veggies except tomatoes in the bowl, put the lid on, and shake to coat the veggies with the oil mixture. Let marinate for at least 15 minutes, shaking the bowl every once in a while, or a few hours in the refrigerator. Preheat grill basket on BBQ over medium-high heat. Add marinated veggies. Season with salt and pepper. Grill and stir occasionally for about 15-20 minutes or until veggies are tender. In the last 2-3 minutes of cooking add tomatoes and arugula and cook until arugula is wilted. Transfer to serving platter and drizzle with balsamic vinegar and top with crumbled goat cheese.